The Nickel Ride is a taut slice of gangster politics. Directed by Robert Mulligan from an excellent screenplay by Eric Roth, the film moves with the pace and portrait of classic noir, but with the sensibility of a political drama. 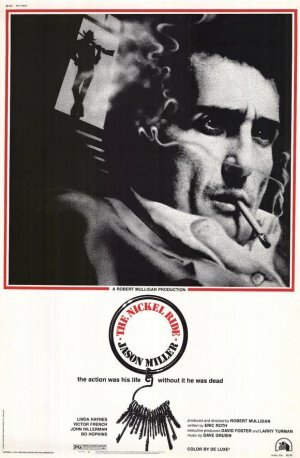 Cooper (Jason Miller in a terrific understated performance) is a property caretaker and occasional go-between for mob business in downtown Los Angeles, who lives with his blonde southern belle, Sarah (portrayed with perfect pitch by B-movie actress Linda Haynes, who’s easy on the eyes if not on the ears). Cooper lets Sarah know just enough about what he does, keeping her safe from knowing too much. A former carnival huckster, Cooper’s smart selling skills have kept him afloat and in the mob’s good graces for a long time. However, the mob is feeling the effects of the economic downturn of the early 1970s, stuck with a surplus of stolen product sitting in crowded warehouses. Cooper manages these warehouses, always carrying a large ring of keys, and is tasked by his boss, Carl (played by John Hillerman), to negotiate a deal for additional storage and protection with the police, but runs into resistance from his cop counterpart, Elias O’Neill (Bart Burns). Unable to close the transaction, referred to as “The Block,” and with revenue on the decline, Cooper’s superiors are keeping close tabs on their middleman, deciding that he’s best dealt with now before any more problems arise. 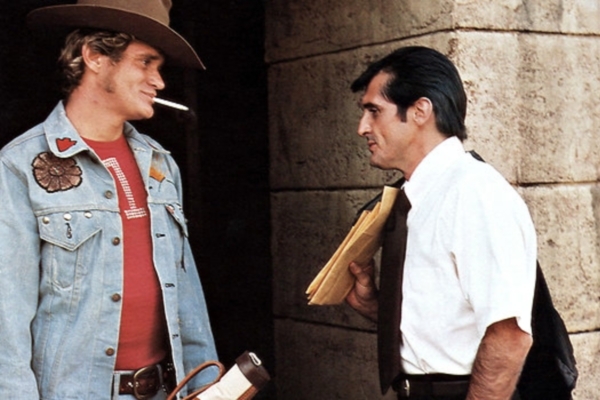 They assign newly recruited muscle Turner (the great Bo Hopkins), an honest-to life cowboy always edging on a violent outburst, to follow and flush Cooper out, with the intent to scare him back on track and eliminate him when he fails. With the police pulling out of the deal, and Cooper gaining no favor with his inability to persuade a boxing trainer and his pugilist to lay down a fight earlier in the film, Cooper must face the deadly eventuality. After sending Sarah off on a train to Las Vegas, Cooper is attacked by Turner, getting hit in a spray of bullets, but survives long enough to choke Turner to death in the apartment hallway. Cooper dies quietly the following morning outside the neighborhood watering hole, dressed in a summer suit, only steps away from his office. Clocking in at just over ninety minutes, the movie wastes no time in introducing its players and setting the course. Roth’s script is tight with no need for last names. His characters speak with purpose. 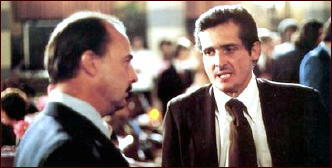 The performances are top shelf and match Roth’s crackerjack dialogue. Fresh off his role as Father Karras in The Exorcist (1973), Miller’s sunken cheeks, sharp chin and withdrawn eyes invite sympathy and concern for Cooper. Miller plays the part like a Washington, D.C. deal broker, lobbying for a peaceful transition to new economics, and looks like he’s been kneed in the balls too many times to complain about it. The lawmakers of this lawless land have changed the rules to suit their needs. As the pressure mounts to move business forward, Cooper grows restless and disenchanted with the process. It weighs like bricks on him and he begins losing his cool. He puts Carl’s driver in the hospital with a vicious beating inside an elevator after learning that his friend, the boxing trainer, was whacked. Then, he stunningly roundhouses Sarah during a heated argument. The final straw is when Elias goes over Cooper’s head to squash the deal. Cooper’s cut down at the knees with no leverage left. Mulligan shines as a director when he allows the action to unfold with steady tension. The film’s most suspenseful moment takes place in the cabin shortly after Cooper and Sarah return from a row on the lake. Cooper scopes out the place after noticing muddy footsteps on the staircase and his gun missing. He leaves a frightened Sarah downstairs. Her stone stare and pale quivering skin tell us all we need to know about where Cooper is heading, and it’s not a good place. Mulligan merely plays on Cooper’s nervous relationship with Turner, who doesn’t even appear in the scene. Another great example is the film’s eerie opening before we are clued in to what’s going on. Cutting between Cooper lying awake in bed and shots of the quiet warehouse exterior, we are reminded of a prison yard and its inescapability. This foreshadows and heightens a clever dream sequence later in the film when Cooper imagines a showdown with Turner in the woods, where Turner wrestles Cooper’s rifle away and kills Sarah. Turner is the film’s most volatile element and the focus of Cooper’s unraveling. Turner is the sneaky aggressor, symbolic of the new protocol. His presence turns a scene uncomfortable, despite his hokey country demeanor. Watch the intimidating way he toys with a hunting rifle while in Cooper’s office, the unease that fills the air during a calculated bathroom visit, and how his teeth clamp down as he snacks on an apple. His behavior is ambiguous. His words are carefully selected. Turner’s murky intentions are meant to leave Cooper guarded and guessing. Cooper’s cabin nightmare is the kicker. Killing off Sarah is the easy way out for him. His daydream is a manifestation of despair and relief. But Sarah is Cooper’s faithful constituency. She worked the carnival circuit as his hoochie coochie girl. She’s there to bandage his body after the elevator brawl. And she doesn’t skip out on him even after Cooper knocks her out. He would only be failing her if he doesn’t seal the deal. And when it falls through, he has no choice but to resist the mob’s enforcements and defend to the last with hopes that he’ll be with her again someplace else. Someplace like Vegas. Sarah is Cooper’s integrity and soul. In this political play predicated on business as usual, the once diplomatic Cooper is facing down a seemingly losing battle, ripping his life away.